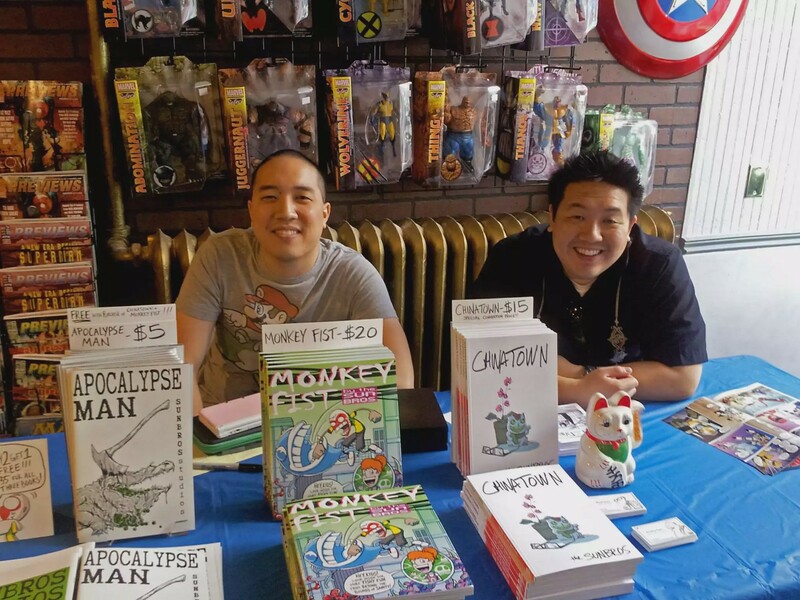 Highbrow meets lowbrow in two Asian-American brother’s comics. Wesley and Brad Sun two are two halves of the self-publishing comic studio Sun Bros Studios. What makes the Sun Bros unique is a shocking synchronicity, having grown up together, the brothers benefit from a shared love of storytelling, comic books and pop culture. Brad Sun (Creative Director) channels his energies into both the art and narrative of each books, while Wesley Sun (Communications Director) expresses himself creatively both by writing the narrative and managing the company’s social media presence. When they answer questions, one brother will answer, and the other will agree before expanding the answer with a companion viewpoint that opens up a totally different perspective. Three years in, they’ve released three full length graphic novels. Most recently, they’ve been busy promoting their brand new novel Monkey Fist, a modern retelling of the Chinese classic Monkey, Journey to the West. I was fortunate to be meet the brothers thanks to the DePaul University Center for Intercultural Programs and the fabulous Professor Laura Kina. RILEY MASUNAGA: You’ve talked about a “unique story that only you can tell”. It’s definitely special to have two brothers working together, but what do you think the two of you have that’s unique? BRAD SUN: I think everyone has something unique. The trick is finding the part of you that’s unique, that other people care about and that you can turn into something entertaining. I like to think of artists like sponges. You try to take in everything they see around around you — pieces of entertainment and media, things that happen during the day, things you’ve gone through in their life… and filter them into something that’s like art. Drawing from those experiences creates a more interesting product and a more honest one. WESLEY SUN: You asked how us being brothers plays into this… Brad & I are influenced by a lot of the same stuff. We don’t always watch the same movies, TV shows or whatever, but I borrow comics from him all the time and vice versa. What’s great is that I don’t know if we’ve ever really disagreed about what we’re going for. When I go to Brad’s place to look at [drawn] pages, theres never been a time where I said, “Well this isn’t what we talked about. This isn’t at ALL what I had in my head”. The advantage of knowing each other growing up, is that we may disagree about particular points of execution, but not about the meat of the book. There are all kinds of artistic mediums you can use to express yourself. So why did you decide to do comics? BRAD: For me personally, I have a fine arts background, and I always get excited about that tension between high and low art… That point where you’re playing with the line between art for the masses and art for the elite. For me, comic books are that perfect medium, with freedom to pursue things in a more literary way and also mass appeal pulp grit. I love the balance. WESLEY: For me, my formal training is in philosophy and religious studies which tend to be text heavy. 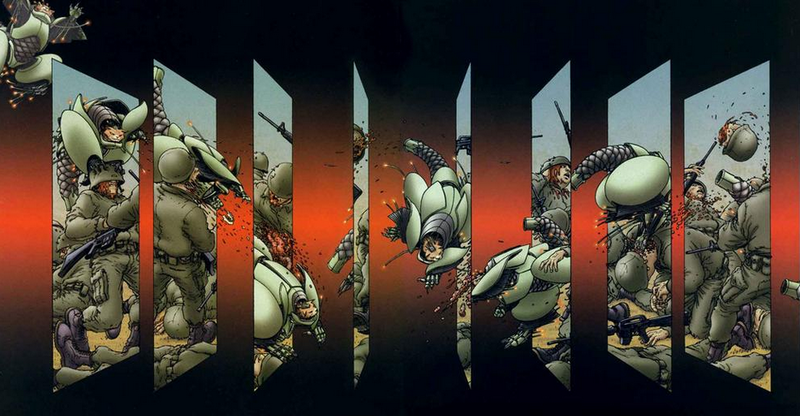 Comics have a kind of visceral appeal for me in storytelling because of their visual component. And, it’s also the medium that i know and the one [my brother’s] able to create. I don’t have some claim that comics are the best or the only medium to tell these stories about life and experiences, but it’s the one that we know. And, we try to tell stories for which comics is the appropriate medium. Sometimes I’ll read a comic and it’s like “Man this comic book writer really wishes he was directing a movie.” We try pretty hard to figure out how we can utilize the medium of comics and not just make a facsimile of some other kind of art. At the end of the day, a comic still needs to be a comic. BRAD: Right, and I embrace that. I think a lot of mediums like video games are coming to their own, where the creators are starting to get too worried about what outsiders think. They’re trying to create “The video game that will make video games reputable.” I embrace the disreputable part of comics but I’m intentional about it. I want it to be an important part of the work we create. Have comics gotten nerdier? You showed us a cool panel from the comic We3 where a character jumps through the panels. It’s really really cool, but only if you understand devices comic artists use. Are things getting more meta like that? BRAD: I think so. Comics are very incestuous in the sense that the people creating them are the fanboys consuming them. That can be good when they do fun tricks with the medium, or bad because there’s this tunnel vision. Basically if your only influences are comics, then you’ll just create dumbed down versions of comics. You see it with music all the time. The original punk [artists] didn’t listen to punk music because it didn’t exist. Now all these [new punk artists ] have listened to is punk music, so the music keeps going down this incestuous downward slope of dumbed down versions of itself. People having a more expansive consumption of media, not just to comic books but gallery art, novels, literature, video games and all kinds of things. pushes the media forward. WESLEY: I would also add that [the trend of going meta] might be true for all kinds of art mediums. You had talked about [the television show] 30 Rock earlier. That’s a TV show about making a TV show. When it comes to movies, films and books, audiences are getting more genre savvy. People consume so much more media than before, and they’re are wise to the devices that artists use to create these experiences. So, [artists and producers] are able to do shows like 30 Rock or Community that, if you weren’t an avid TV watcher before the show, you would miss a fair amount of the jokes. Similarly, it seems like comics and other medias are getting a lot darker and embracing anti-heros. I grew up mostly with old 80’s comics like Justice League which were never very threatening. There was Frank Miller’s Batman and Watchmen, but it seems like almost all comics embrace that darkness. Like i said before, what [artists] need to do is not worry so much about what other people think about [their work]. I feel a lot of these dark serious works are artists trying to make comics seem more mature and more like literature, when really if they just chilled out and told the stories that they wanted to tell, you would really get a more interesting better quality product. A lot of people dream of being able to be artists or a creative like you two. What are things you’re thankful for as artists? WESLEY: It sounds a bit corny, but I’ll explain it. I’m grateful that my brother is the creative director of our company and I’m grateful to have him to collaborate with. I write but i’m kind of dependent on Brad’s creative abilities and work to get my work out there. I wasn’t trained in art and I don’t know what i would have done to go out and look for an artist. I’m quite grateful that I was born into an artist partnership. BRAD: Our parents… Maybe it’s because of our Chinese background or what not, but they instilled in us a strong work ethic. when it comes down to it, it’s hard work to be an artist. Not in terms of ‘it’s hard to think of stories’ but the actual labor of illustrating. it’s a lot of being alone sitting at a drawing table. I don’t enjoy sleepless nights working on [a project], If I could skip the labor I would. I’m an ideas guy. I treat [the art process] like a job — it motivates me to keep going. You guys have have been successful both on Kickstarter and at conventions. so if you could give yourself some advice when you first started what would you say? BRAD: I would say start earlier. For a lot of artists there’s this moment where you kind of dip your toes in the pool — you’re hesitating and overthinking things. The sooner you start actually getting something on paper, whether its a script, or pages just do it. because the best way to get good at it is to just do it more and more. I mean, if i think about it like music, you don’t go to a recital the first time you play a piece and think you’re going to nail it. You practice ahead of time. You don’t want your big shot at comics to be the first time you’re drawing. WESLEY: If I had a time machine I would tell myself to trust in the work. We took a lot of risks when we did Chinatown. We were given a lot of advice not to start with a big graphic novel (Chinatown is 120 pages in full color), a lot of people told me, ‘Do a smaller black and white stapled floppy’ or whatever. There were a lot of sleepless stressful nights of ‘Oh my god, how much money are we going to put into this thing and nobodies going to buy our book.’ Brad was good at reminding me that the art drives the project. Everything we said in this interview I think is right, you have to be considerate of what people want to buy, you have to think about what makes for a good table at the convention and all that stuff, but at the end of the day what’s driving the bus is the story you’re telling and the way that you’re going to tell it through your art. I think that I really should have trusted our abilities as artists more when we started. Because at the end of the day it all comes back to the product. How good is the art? How good is the story? Because what kind of life is that? Stories with people of all walks of life.